Ahlen, May 2010. – Kaldewei, the European market leader for steel enamel baths and shower trays, emphasises its whirl competence by introducing a new, exclusive lighting concept for the Vivo Turbo whirl system. Vivo Turbo is the only system in the world to have specially developed nozzles which mean it can completely forego the otherwise usual piping and pump. This system is now also available with illuminated jets, thanks to the use of modern LED technology, which create an atmospheric setting for the whirl bath and support the positive influence of light on body and soul. 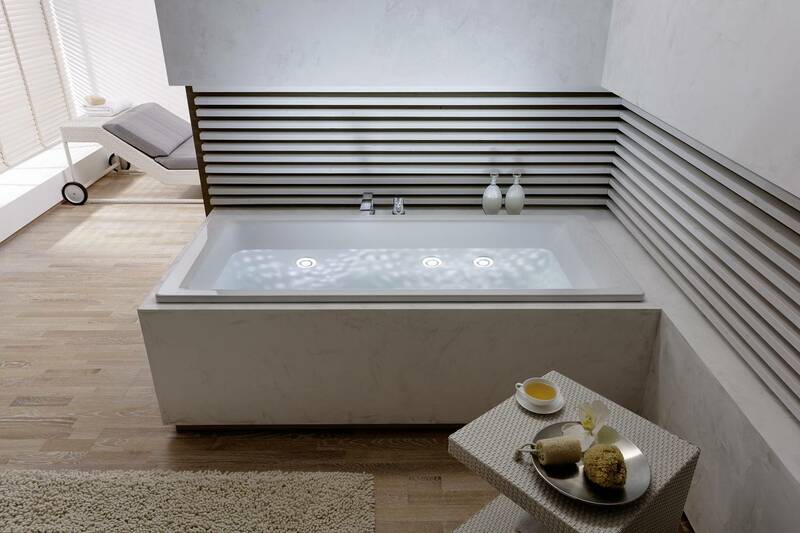 The illuminated Vivo Turbo jets bathe the water in the bath and the surrounding room in an positive atmosphere. This emotional lighting generates an even more intense experience in the whirl bath, because the interaction of water, warmth and light produces a long-lasting deep relaxation. The special design of the whirl jets produces an extraordinary, interesting pattern of light in the bathtub which creates an atmospheric visual highlight in the bathroom. Kaldewei offers this innovative lighting concept in two different colour worlds: the customer has the choice of blue or white light. Physically, white is the sum of all the colours. White has no negative associations, it is therefore the most perfect colour. White symbolises light, wisdom, cleanliness and thus creates the ideal connection with the bathroom as wellness and relaxation space. The colour blue is calming and relaxing, contributes to finding inner and external peace and to reducing stress and a hectic atmosphere. It stands for harmony, space and calm, is considered to be the colour of mood and generates positive feelings. Every nozzle of the Vivo Turbo and Vivo Turbo Plus is equipped with its own motor which draws in the water directly at the nozzle and directs it as an intense massaging jet onto the desired parts of the body. Vivo Turbo Plus also offers individually adjustable whirl programmes where individual pairs of nozzles can also be operated in sequence. The new lighting system operates in the same way as the respective whirl function. In interval mode, an automatic increase and decrease of the whirl intensity also varies the light intensity of the illuminated jets according to the strength of the massaging jet. If individual pairs of nozzles are operated by the whirl programme of the Vivo Turbo Plus, only those jets immerse the bath in blue or white light. The lighting can be switched off while the whirl bath is in operation or used without the whirl function. Source: Franz Kaldewei GmbH & Co. KG. Proof requested. Kaldewei emphasises its whirl competence with the introduction of a new, exclusive lighting concept for the Vivo Turbo whirl system, which create an atmospheric setting for the whirl bath and support the positive influence of light on body and soul. The special design of the whirl jets produces an extraordinary, interesting pattern of light in the bathtub which creates an atmospheric visual highlight in the bathroom. 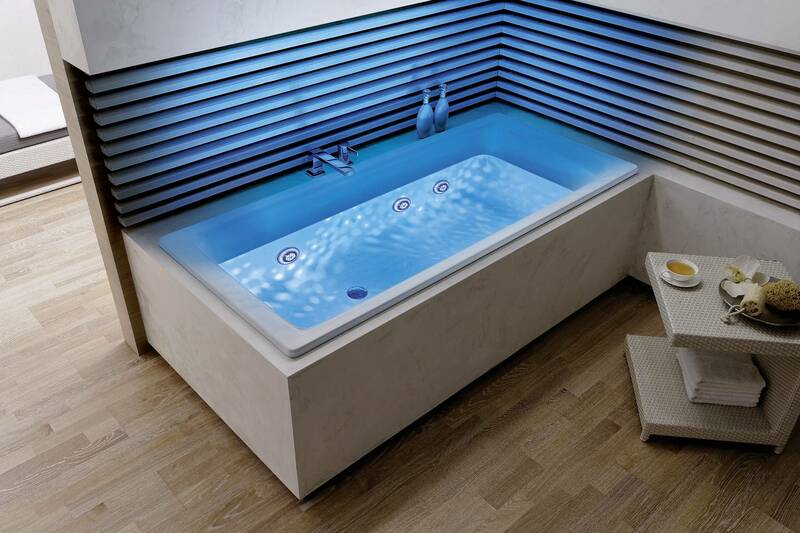 The illuminated Vivo Turbo jets bathe the water in the bath and the surrounding room in a positive atmosphere. This emotional lighting generates an even more intense experience in the whirl bath because the interaction of water, warmth and light produces a long-lasting deep relaxation.